Have your students ever wondered why they should practice their scales, and what this has to do with mastering their instruments? 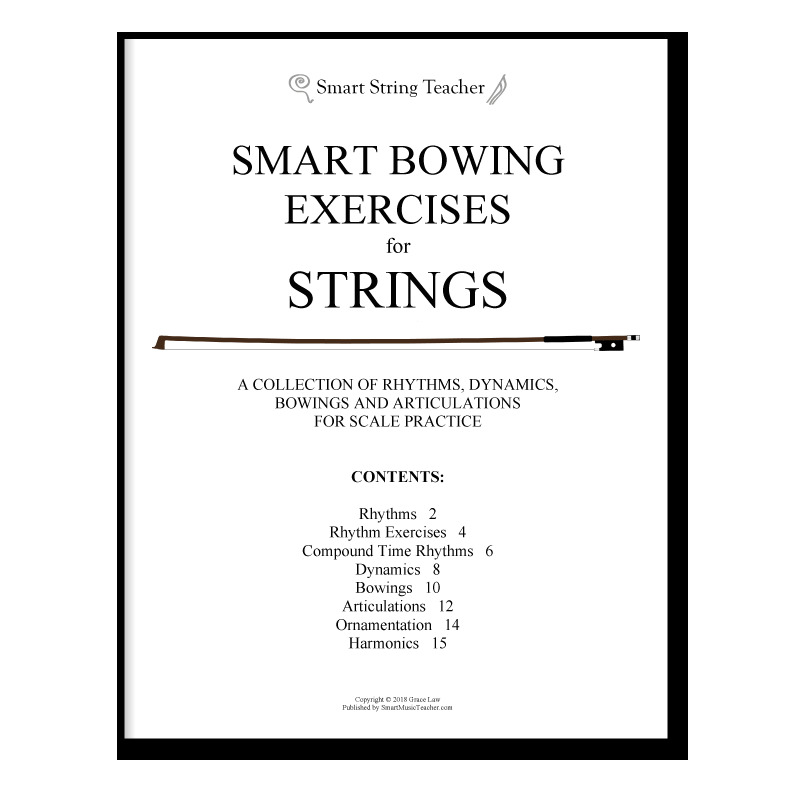 Well, Smart Bowing Exercises for Strings will give them over 100 reasons why! 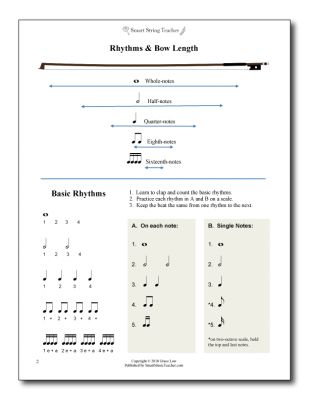 This truly unique resource has well-organized and easy-to-use rhythms, dynamics, bowings, and articulations for scale practice, as well as bow diagrams and descriptions on how to use the bow. 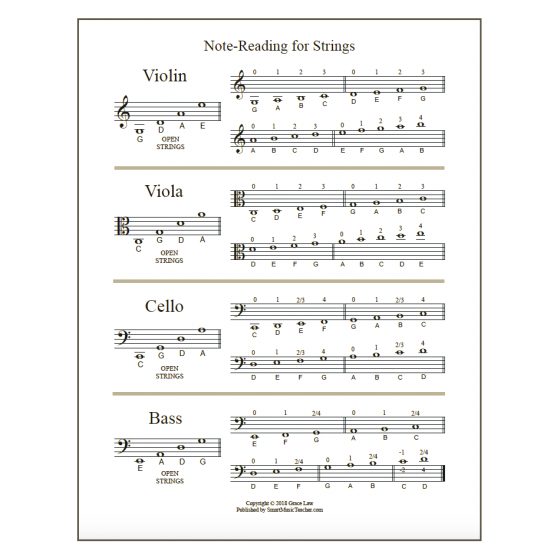 Your students will have all the information they need to master the many bowing skills needed to play violin, viola, cello or double bass. Unique diagrams illustrating how to use the bow. 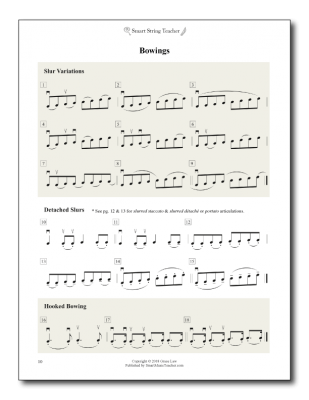 Well-organized exercises for all common rhythms, dynamics, bowings, and articulations. Rhythms arranged in groups of related rhythms. Descriptions of various methods for playing each dynamic. Groups of common bowings, including hooked bows & bow retakes. Descriptions for many articulations, including tremolo, marcato, sul tasto, etc. A section on ornamentation and harmonics. Students can easily see the progression and work ahead on their own. Students can see at a glance how valuable and fun scale practice can be! 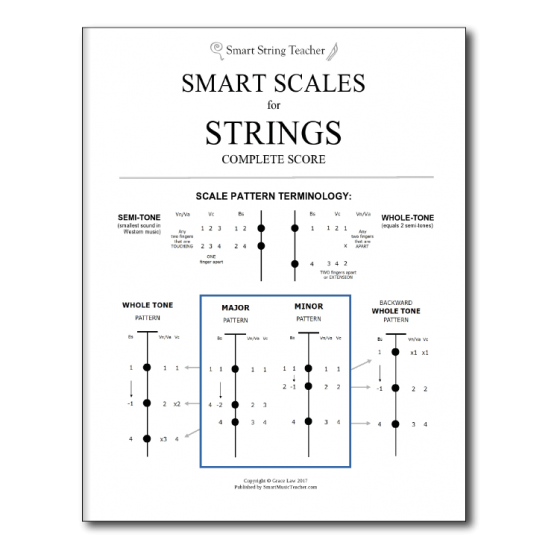 As I developed Smart Scales for Strings, which took form over many years, I knew that the next project on my list would be to write a collection of bowing exercises to accompany them. After I finally finished the scales, I started to think more seriously about what I wanted these bowing exercises to look like. It started off last year as some scribbles and some diagrams of the bow, but I was otherwise uninspired for months. Then, after doing a spontaneous brainstorm with my class on why we should practice scales, I went home in a flash of inspiration and Smart Bowing Exercises for Strings was born! Little did I know that it would turn out to be the most amazing resource for bowing exercises ever, if I do say so myself! 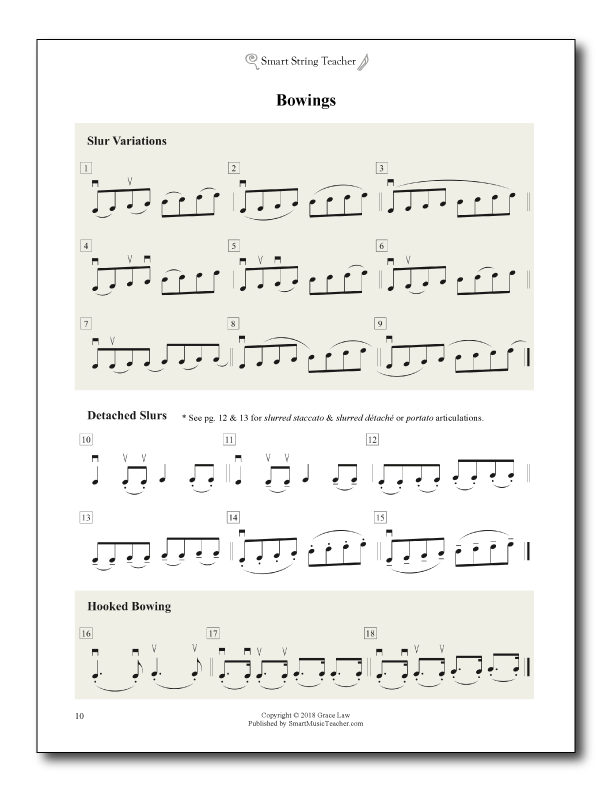 No longer do you have to write out rhythms and explain them. No longer do you need to describe repeatedly what part of the bow is needed to play a certain dynamic or articulation, or how much bow to use. 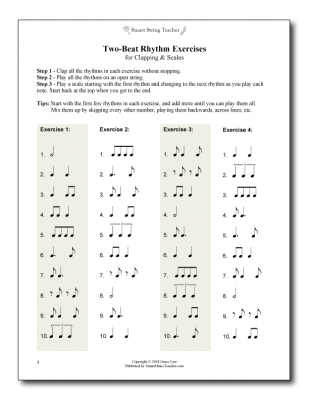 No longer do you need to make up rhythm exercises or use cue cards to drill your students. Smart Bowing Exercises for Strings will help you do all this, and more! How can this be, you ask? Just read on! Little things like knowing what part of the bow to use or how much bow is needed can make a huge difference in successful bowing technique. That is why bow diagrams are an essential part of Smart Bowing Exercises for Strings. 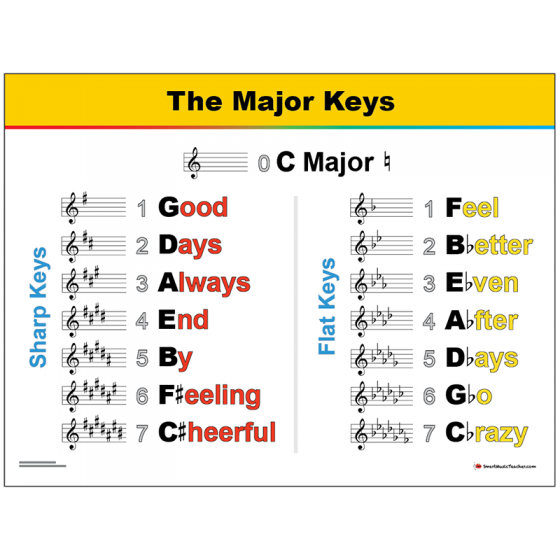 With the diagrams, students can immediately see what they have to do, making it that much easier for you to help them master that rhythm, dynamic or articulation. So simple, yet so effective. Many rhythms are related in that they are just faster or slower versions of each other. It makes sense to learn these rhythms together, and as such, Smart Bowing Exercises for Strings uniquely presents these rhythms in their related groups. 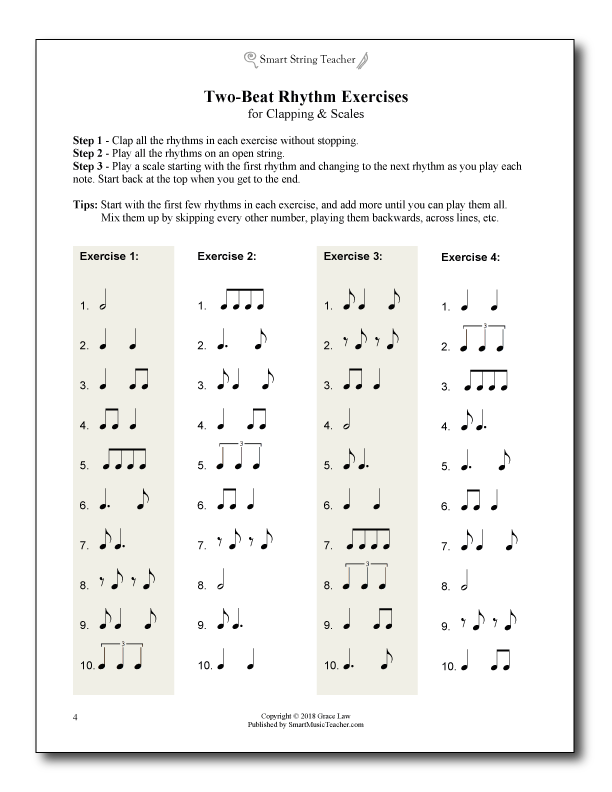 This makes it easier for students to recognize the rhythms’ relationships, and makes them easier to learn. The rhythm exercises in Smart Bowing Exercises for Strings are organized in vertical rows so that students learn to see rhythms as one or two-beat units. Compound time is also introduced in one-beat units. The exercises are very flexible, so you can make them as easy or as challenging as you like by breaking them down into smaller groups, skipping numbers, playing them backwards, etc. Teaching students to see rhythms in units is essential to developing excellent rhythmic sight reading skills. There are many different methods for producing a desired dynamic. This section includes a diagram to illustrate the amount of bow that is generally used. 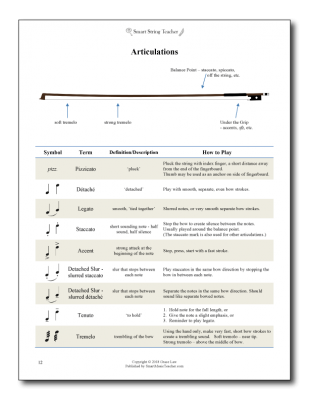 It also includes a chart describing various other options for producing dynamics such as the weight of the bow on the string, the proximity of the bow to the bridge or fingerboard, and the part of the bow being used. Students can quickly see that there are multiple ways of producing different dynamics. Many bowings share similarities, so Smart Bowing Exercises also groups related bowings together. 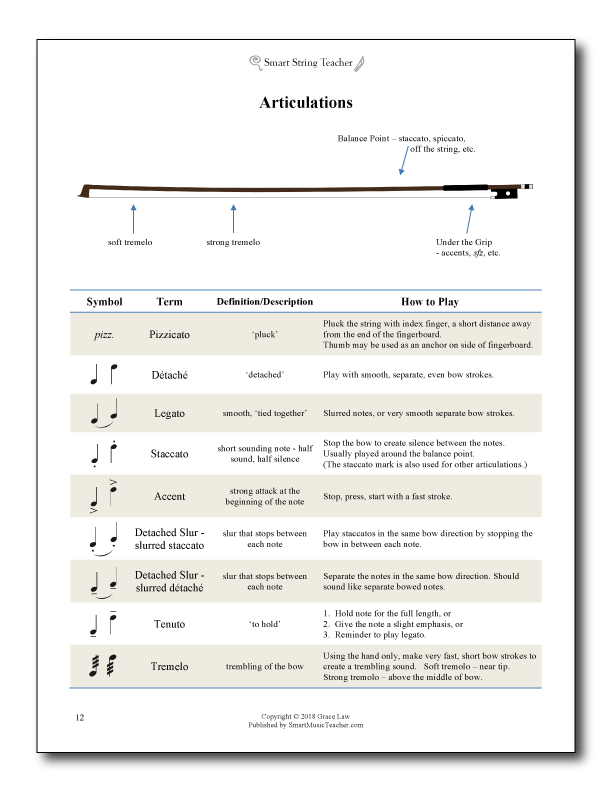 This section includes common slur variations, detached slurs, hooked bowings, bow retakes and pizzicato/arco combinations. Similar bowings can be learned together, which helps students master them more easily. Rarely does a student have a ready reference for all the articulations they may come across over the course of learning their instrument. 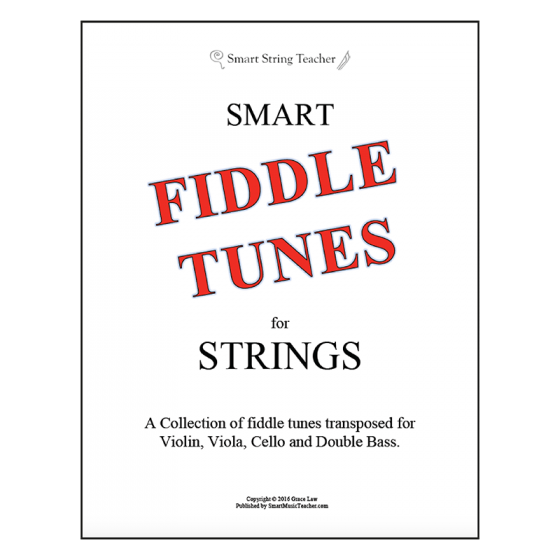 Smart Bowing Exercises for Strings provides students with clear descriptions of the many articulations they may encounter and may need to master. It inspires students with the variety of articulations that are possible on their instrument. 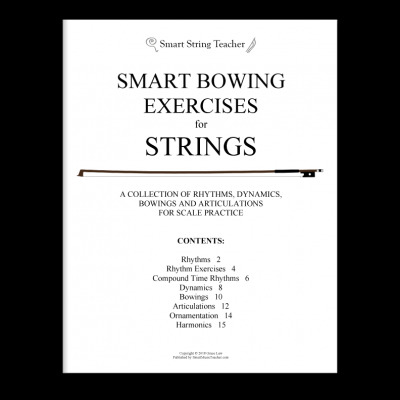 Finally, as an additional supplement, Smart Bowing Exercises for Strings includes a reference for different types of ornamental markings and harmonics. What is an appoggiatura vs. an acciacatura? Want to know the difference between a mordent and a trill? Can’t remember how harmonics are notated? Even though they are not bowings, this section is a great reference for all these markings that are regularly encountered by string players. Wow. 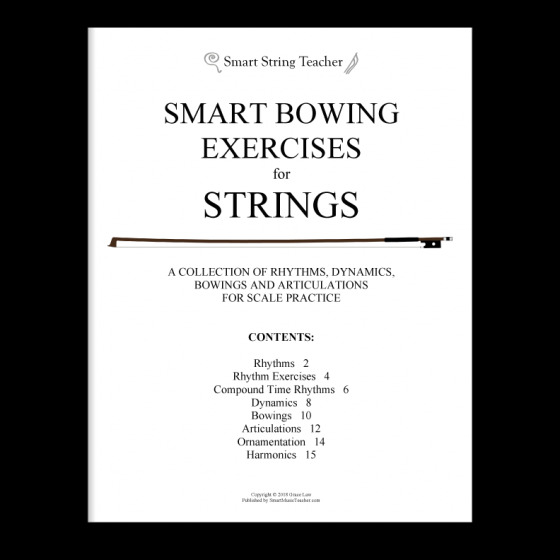 As you can see, Smart Bowing Exercises for Strings is both an essential reference for your students and an invaluable guide to help them master a variety of skills. It’s all bowing technique and terminology rolled up into one convenient resource.